1. Castanea sativa (Sweet Chestnut)- hulls soaked, boiled and soaked again, then strained and simmered. Yarn pre-mordanted with alum and cream of tartar. 2. Unidentified foliose lichen (collected nine years ago! )- second bath, after remembering that I had to boil it before adding the yarn. Yarn unmordanted. 3. Unidentified foliose lichen (collected nine years ago! )- first bath, added unmordanted yarn and lichen to cold water then gently brought to simmer. 4. Solanum laciniatum (Large Kangaroo Apple)- leaves soaked overnight then simmered. Yarn pre-mordanted with alum and cream of tartar. 5. Solanum laciniatum (Large Kangaroo Apple)- as above, then modified with ammonia and copper. 6. Unidentified foliose lichen from property in South Gippsland- soaked, boiled and soaked again, then simmered. It is making me think about how far I’ll go to get colour… the process of modifiying with copper opened my eyes to just the beginnings of how far one dye bath can range but, without knowing how much is left in the water, I am not comfortable introducing mordants of this kind into the environment simply for fun. I need to play around with copper and iron alternatives like using copper pots and adding rust to the dye-bath… and, anyway, I’m loving what I am finding without even going there yet. There are now a series of jars in various stages of deshabillement around the house- containing soursob, flowering gum, rosemary, fennel and various mushrooms- and Scotto is slightly nonplussed about it all. I, however, am completely overexcited and so looking forward to both the first meeting of our new dyeing group in November and the imminent experiment with… deep breath… indigo at the guild. Undoubtedly more to follow here. 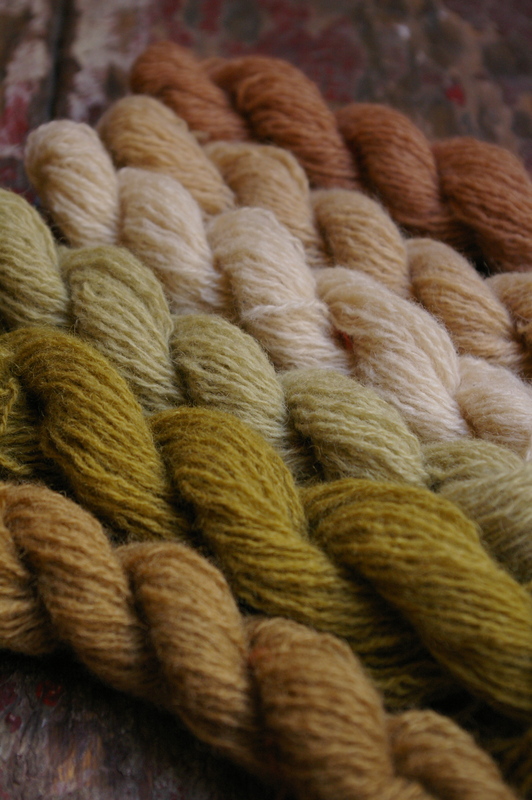 This entry was posted in dyeing, plants on October 26, 2011 by admin. Absolutely beautiful, love the base yarn too what is it? I’m sending you a PM via Ravelry. Lovely results Jules. I’m looking forward to hearing all about it soon! Beautiful colours, one day I must do some more experimenting, looking forward to hearing more about yours. Beautiful colours Jules, just gorgeous. I used to use copper and iron as mordants and modifiers but these days I am trying to be as eco friendly as possible in my dyeing … my colours may not be as permanent but I can always redye things if they fade. A new dyeing group sounds so exciting, nothing like that here unfortunately. Amazing colour Jules. 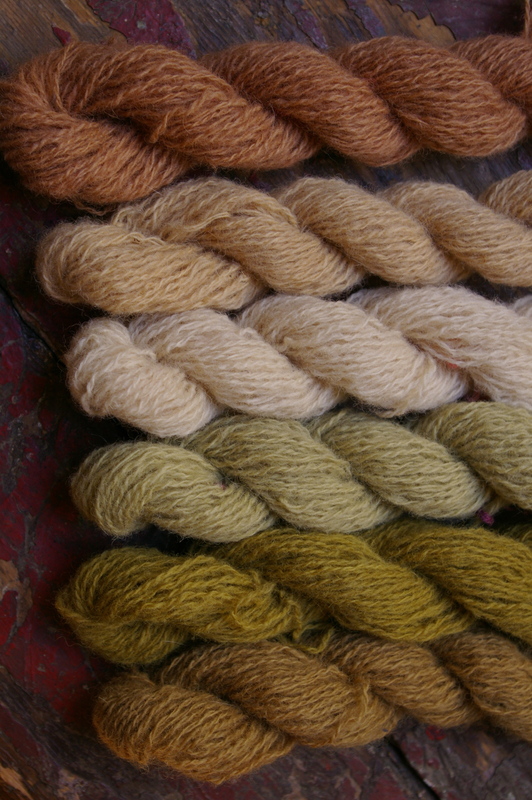 I really like seeing how your natural dyeing experiements turn out! Wow, stunning! Especially together. They would make a beautiful colourwork garment. so pretty – wondrous colors ripe for colorwork! Oh my goodness, the kangaroo apple!!! They’re all lovely though.